The world of business is ever changing, with much of the available information becoming quickly out-of-date. Business Fundamentals for the Rehabilitation Professional, Second Edition keeps pace with this changing world and provides the health care professional with the latest information to answer the “what, where, how, and when” questions that come up when transforming a health care practice idea into a successful business. With this updated Second Edition , Tammy Richmond and Dave Powers take the health care professional to the next level of implementing successful business operations by the introduction of applications of management principles, as well as implementation of evidence-based practice guidelines and basics to billing and coding documentation. 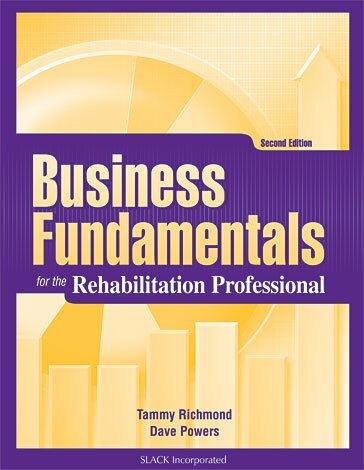 Business Fundamentals for the Rehabilitation Professional, Second Edition addresses how to identify emerging business opportunities, legal and health care regulatory issues, market research and development, and health care operations. Keeping the user-friendly format of a workbook, Business Fundamentals for the Rehabilitation Professional, Second Edition is the perfect resource for master and doctorate level students preparing for the professional world, as well as rehabilitation professionals and entrepreneurs interested in obtaining knowledge in starting up, managing, expanding, or understanding the health care practice system. "The book is written in a straightforward, easy-to-read format. It presents the basic principles of development and operation of a private rehabilitation practice in language appropriate to the management of any small business. The writing style lends itself to rehabilitation professionals who are novices in the area of business management and who are just beginning to explore the conceptual ideal of developing a private practice. Also contained in the book are many tables in each chapter and appendices that provide sample forms the reader can use to implement each step in the creation and development of a rehabilitation practice. Business Fundamentals for the Rehabilitation Professional is a worthwhile read for any rehabilitation professional who is considering opening a private practice. It will provide the basic knowledge to determine if the development of a private practice is a good move and will provide a basic framework to guide the decision matrix required to develop and implement a viable and sustainable business endeavor." "I recommend this book for any rehab professional who is even thinking about starting a business practice. It is useful for non-rehab business start-ups. In addition, the text could be used by existing rehab businesses to improve on current practices." "The book is an effective short course in developing a business plan for a new health care enterprise. The step-by-step approach to developing core documents, as well as the book's extensive use of checklists for planning, adds value to this offering. It provides practical, thoughtful guidelines and information that can lead to success in such a venture." "I would highly recommend this book for any self-employed therapist just starting out or even those already in private practice." "I feel confident in recommending Business Fundamentals for the Rehabilitation Professional to all eager entrepreneurs. This is a great book to start your journey into the business world." Tammy Richmond, MS, OTRL, is partner of Ultimate Rehab, LLC, Pacific Palisades, CA and an owner of a clinical private practice called Hands 4 Health. She is an adjunct professor at USC, a legal expert, and an author. She also holds positions in state association committees. Dave Powers, PT, DPT, MA, MBA, is partner of Ultimate Rehab, LLC, Pacific Palisades, CA and an owner of a clinical private practice. He holds positions within the national and state Physical Therapy Associations, holds faculty positions at Mount St. Mary’s College, Los Angeles, CA and University of Southern California, Los Angeles, CA, and serves as an expert witness and investigator for the State of California Licensing Board.